Discover Miami's burgeoning art scene with this guided, 5-hour, small-group studio tour during the annual Art Basel in America show. The Miami Beach show presents artwork from across the globe, with the world's leading galleries participating. This customizable art tour explores an alternative side of Miami's Art Basel. Meet directly with the featured artists, visit their studios, and get a chance to purchase works directly from them. Hotel pickup and drop-off is included. Tour refundable when you buy $1500 of art. Select from a morning or afternoon departure time in Downtown Miami for this unique art tour. At the nexus of North America and Latin America, the Miami Beach Art Basel show presents artworks from across the globe. The world's leading galleries participate, drawing over 70,000 visitors each year. On this tour, take the opportunity to see what some of the Art Basel artists are working on, ask what inspires them, or hear the story behind a particularly interesting piece. The possibilities for dialogue are infinite. The tour is led in English, Spanish, or German to ensure personalized, professional attention for all throughout. After a hotel pickup, travel by private transportation to the studios of up to four artists, and end the tour with a catered reception to view the rest of each collection, socialize, and complete purchases of any works that were chosen. 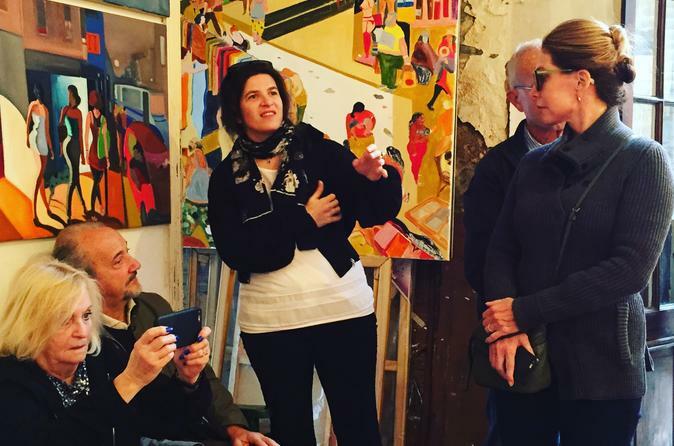 This tour is aimed at bridging the gap and deepening the connection between artists and audience by offering an insider’s look at contemporary art. It is the perfect tour for all tourists, collectors, curators, and art enthusiasts alike to have an unforgettable experience.